There is always hope for a tree: When felled, it can start its life again; its shoots continue to sprout. Benedictines have always been attracted to the tree as a metaphor for the growth and dissemination of the Benedictine way of life - most often in the genealogical sense of family tree, growing as each monastery in turn gives birth to new "daughter houses." St. Scholastica Priory, for example, traces its lineage back though houses in St. Joseph, MN; St. Mary's, PA; and Eichstatt, Bavaria; to the convent of Nonnberg in Austria which first adopted the Rule of Benedict in the eighth century. This genealogical tree is somewhat misleading, though, because it invokes an image of unbroken continuity between root, stem and branch which has not always been the case in Benedictine monasticism. A more accurate model is that of the tree repeatedly cut down, but whose roots continually send forth new shoots. Indeed, the motto of the monastery of Monte Cassino is succisa virescit: "cut it down, and it grows up stronger." Within 50 years of St. Benedict's death Monte Cassino was destroyed in the Lombard invasions as were most other monasteries in central Italy. The monks fled to Rome. For the next 300 years the history of the use of St. Benedict's Rule by monks and nuns is fragmentary and unclear, as monastic houses all over Europe tended to use several rules simultaneously as a guide to their lives. Pope Gregory I, the author of the Dialogues and a great admirer of Benedict and his Rule, sent the monk Augustine to England in 596. There he established a monastery at Canterbury. By 650 the Rule of Benedict was widely accepted in English monastic houses. At about the same time Columban, an Irish monk, set out to establish monasteries in Gaul. By mid-seventh century many Gallic houses had adopted the Rule of Benedict along with Columban's Rule. In 718 Boniface, an English monk, was sent to Germany as a missionary where he reformed the Frankish church and founded monasteries whence the Rule of Benedict spread to Scandinavia and Eastern Europe. These were centuries of noted English Benedictine scholars - Hilda of Whitby (d.680), Bede of Jarrow (d.735), Lioba of Wimbourne (d.782) - authors, patrons of the arts, administrators and consultants to ecclesiastical and secular rulers. When Charlemagne became Holy Roman Emperor in 800, he set out to create uniform religious practices throughout his empire. This program of reform was continued by his son, Louis the Pious. The Benedictine monks Benedict of Aniane (d.821) and Alcuin of York (d.804), served as advisors to the Carolingian court, and through their influence the Rule of Benedict was mandated for all religious houses in the Empire. This attempt at standardization was brought to an abrupt end by the political turmoil of the dissolving empire, and the Viking, Saracen and Magyar invasions of the ninth century, during which many monasteries were once again destroyed. In the 10th century and after, new foundations with a new mode of monastic governance came into being: the monastic confederation - groups of monasteries following the same rule and customs, and looking to a centralized authority separate and independent from the local bishop or secular prince. First among these both in time and in importance was Cluny (founded in 910) and its affiliated houses, which was to become a veritable monastic empire of great wealth and refined culture. The 10th through 12th centuries are the "Benedictine Centuries" during which Benedictines were instrumental in shaping the European world artistically, literally, academically, spiritually and even politically. These are also the centuries of reform to the austerity of the "pure" life of the Rule with the foundation of the ascetical orders of Camaldolese and Cistercians. This is the age of the great Saxon nuns: scholars and mystics such as Hrotsvit of Gandersheim (d.1002), Hildegard of Bingen (d.1179), Mechtild of Magdeburg (d.1282), and Gertrud of Helfta (d.1302). It is the era of the theologians Anselm of Canterbury (d.1109) and Bernard of Clairvaux (d.1153), as well as Abbot Suger of St. Denis, who started the fad for the Gothic style of architecture. It is often said that the Benedictines, as they spread through Europe, brought with them "the Cross, the Book and the Plow." In doing so they were instrumental in transforming the barbarian invaders of the late antiquity into the cultured Europeans of the middle ages. In recognition of this, Pope Paul VI declared St. Benedict to be Patron of all Europe in 1964. From the 13th century onward monasticism and its influence declined. There were a number of causes, including the removal of monastic governance from the hands of monks, a shift from a feudal-agricultural to an urban-mercantile economy, wars, harassment by secular princes, the Black Death, the foundation of popular new mendicant orders which were perceived to be more "socially relevant," and eventually the Protestant reformation which caused once again the wholesale extinction of monasticism in Protestant Europe. It was not until the 19th century that what are now the great men's and women's abbeys of Europe were refounded in Bavaria, France, Germany and Switzerland. In 1846, from the newly reestablished Bavarian abbey of Metten, a new Boniface - Boniface Wimmer - set out for the mission fields of the New World. He arrived in Latrobe, PA, where he founded a monastery and set to work with the German immigrants who had settled in the area. In 1856 he sent monks to Minnesota to establish what is now St. John's Abbey. Early in his American career he decided he needed nuns to teach the immigrants' children, so he persuaded the nuns at St. Walburg's Abbey in Eichstatt to send a delegation. In 1852 two choir nuns and a lay sister, headed by 26-year-old Benedicta Riepp, arrived in the American wilderness at St. Mary's, PA, to start a parish school in their two-room convent. These nuns, who would later be joined by nine others from Bavaria and a flood of American candidates, faced tremendous challenges. They had not only given up a comfortable, cultured life in their Bavarian convent for one of crushing poverty and unending labor on the frontier, but were also forced to relinquish their ecclesiastical status as nuns because of the impossibility of maintaining the prescribed enclosure and the traditional monastic prayer schedule. Their new candidates were permitted to take the simple vows of active sisters rather than the solemn vows of the enclosed nuns. Although today's American Benedictine women have reclaimed all the traditional monastic hallmarks except for enclosure, and although Canon Law no longer distinguishes between simple and solemn vows, these distinctions still divide us from our European counterparts. In 1856 Mother Benedicta sent six sisters to St. Cloud, MN, and eventually joined them there before her untimely death at the age of 37. It was about this time, in 1862, the St. 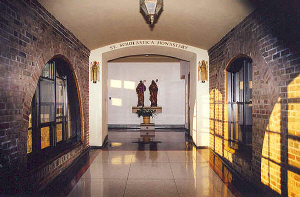 Cloud community moved to its present home in St. Joseph, MN, to become St. Benedict's Convent. In the same year a 15-year-old girl from St. Paul, who had come to America from Prussia with her parents when she was five, entered the Benedictine community at Shakopee. Her wealthy father was appalled by the poverty of the struggling community, and in 1877, his friend the Abbot of St. John's, secured her transfer to the community at St. Joseph. Scarcely three years afterwards the 33-year-old Scholastica Kerst was appointed prioress of the St. Joseph community by the same Abbot. In her nine years in office Mother Scholastica demonstrated a talent for organization, administration and foresightedness that was to extend the mission outreach of her community from the St. Cloud area into much of Minnesota and North Dakota. In her first year as prioress she traveled north to Duluth to investigate the possibility of establishing a school. In 1884, after a couple of abortive starts, a school was opened and in 1888 a hospital - the present St. Mary's. In 1889 her term of office at St. Benedict's ended. The bishop of the newly-created diocese of Duluth, James McGolrick, wanted a Benedictine priory of his very own, so in 1892, 28 sisters and four postulants, headed by the indefatigable Mother Scholastica Kerst, established in rented flats in Munger Terrance the independent Benedictine community which eventually became the St. Scholastica Priory.